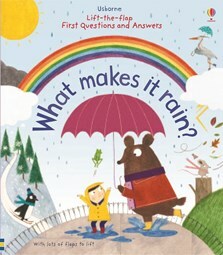 With flaps to lift on every page, this delightful book answers the questions that all young children ask about the weather, from Where does wind come from? to Why is it colder in winter? With surprising facts and weather forecasting tips, it makes a brilliant introduction to weather, which is a UK National Curriculum topic for Years 1 and 2. Packed full of the beautiful Usborne style illustrations I love, and reminds me of books of my childhood, with sturdy flaps and engaging questions. Filled with charming hand-drawn illustrations, it's an incredibly sweet non-fiction book that will turn your little one into a weather expert.